The Bridge River Kwai became famous all over the world, when it was featured in movies and books. The cliff-hugging tracks and the natural beauty of the surrounding mountains and valleys are well captured in the David Lean movie. Bridge River Kwai is a tourist destination now. The track is developed into a walkway with side platforms. This allows crossing the railway bridge on foot. These platforms are useful as viewpoints and for avoiding trains. A small tourist train runs back and forth across the bridge. Every year, River Kwai Bridge Festival is organized to mark the Allied bombing on November 28, 1944. Spectacular light and sound show is the highlight of the festival. 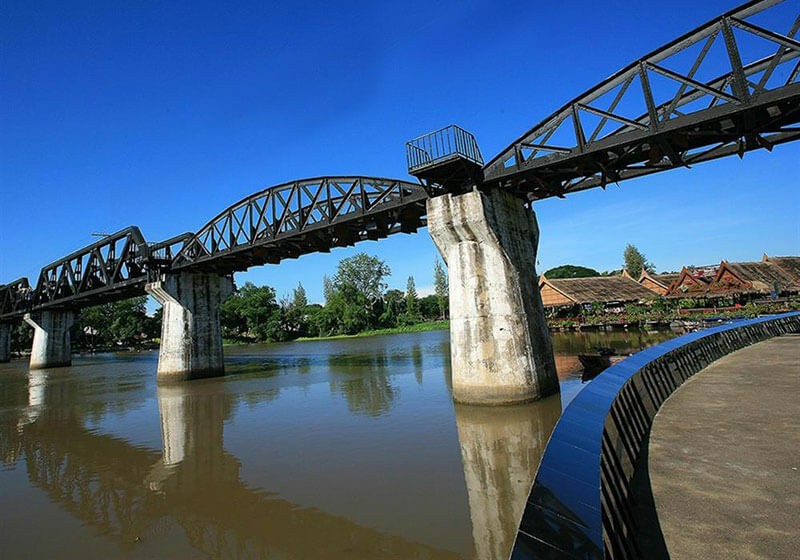 Short Description: This steel bridge is one of important historical landmarks and memorials in Thailand. It is almost a symbol of the province and is a recommended place in Kanchanaburi travel guide. The history of the bridge is well known, as it was part of the railway lines in World War II and had seen its share of conflict and bloodshed. After World War II, the damaged bridge was renovated by the Thai government in 1946. The Bridge of the River Kwai Memorial Week is held during late November to early December every year, where there is an exhibition about World War II and the history and archaeology of the bridge. Folk performances, local goods markets, and other entertainment are also scheduled at the event.